Recently I took part in a wine tasting debate that was all about Cabernet and Merlot blends. My job was to champion the wines of California while other wine educators championed Bordeaux and Australasia. It took place at the West London Wine School where I do quite a lot of teaching as well as events like this, so keep an eye on the web site, there are more of these debates to come. Well, I was really thrilled to be able to show people good some really good California wine, the state makes great, great wine that somehow gets ignored, by and large anyway, over here in the UK. I think most UK wine drinkers only ever see the cheap, simple, overly fruity mass market, branded bulk wine examples and assume that is what all California wines are like. Nothing could be further from the truth and it is a shame that UK wine drinkers don’t often get the chance to try California wines that are a little more complex and interesting as there is plenty of good stuff to be found. It is widely believed, of course, that the good stuff from California is all very expensive and while wines from California can cost a lot of money, that does not mean that you cannot find good value. 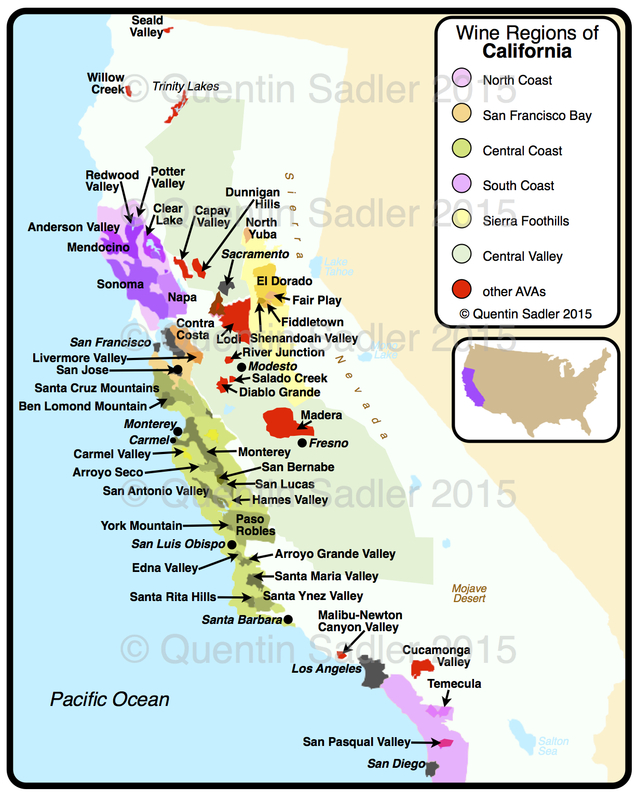 Many UK wine drinkers either forget, or never knew, how important California is in terms of wine. It has a long history of making premium wine and it makes a lot of it to. California would be the fourth largest wine producer in the world if it was a separate country. I love the history of the place, but will leave that for another time. It’s cultural importance as a wine producer really began in the 1960s when a group of pioneers – I was lucky enough to meet many of them early in my career, including Bob Mondavi, Joe Heitz, Paul Draper of Ridge, Warren Winiarski of Stag’s Leap, Jamie Davies of Schramsberg and Frank Woods of Clos du Bois – started to seriously make ambitious wine. Of course they were building on those that had come before them, but they realised the potential in this sunny state that had dry conditions and a Mediterranean climate. Really they created the modern world of wine. Before this we had never seen wines that were so technically well made – it helped that UC Davis had become one of the world’s preeminent agriculture and viticulture research stations by this time – and what’s more they were amongst the very first wines sold with a simple grape variety name on the label – new world wine as we know it was born. 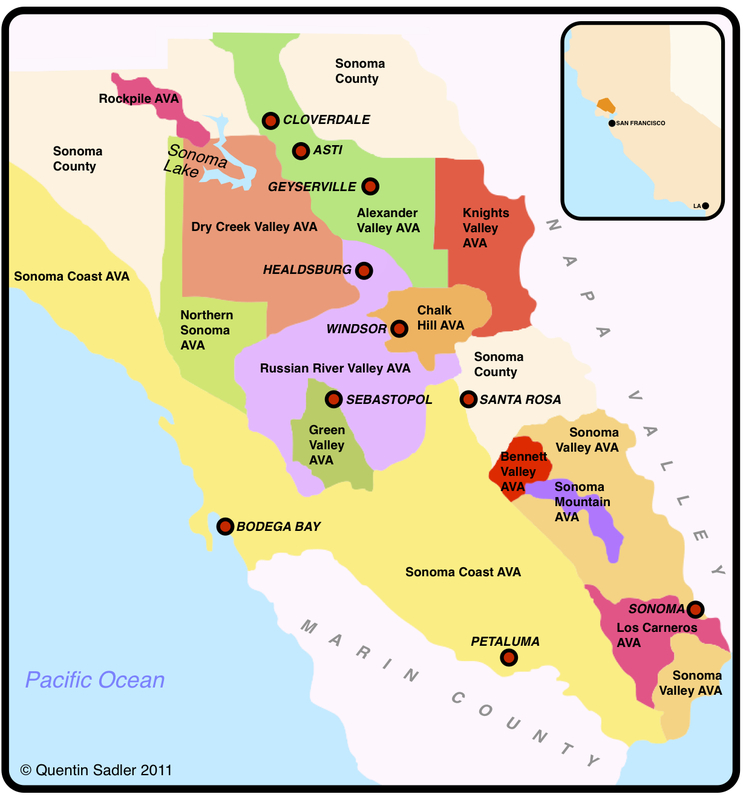 Wine map of California – click for a larger view. High-res non-watermarked versions of my maps are available by agreement. 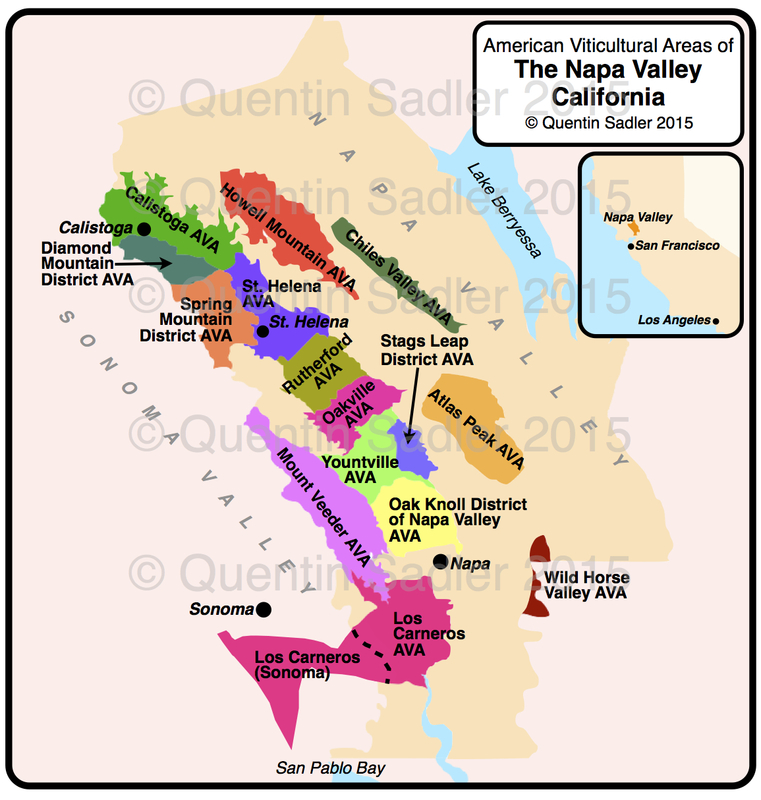 Wine map of The Napa Valley – click for a larger view. High-res non-watermarked versions of my maps are available by agreement. 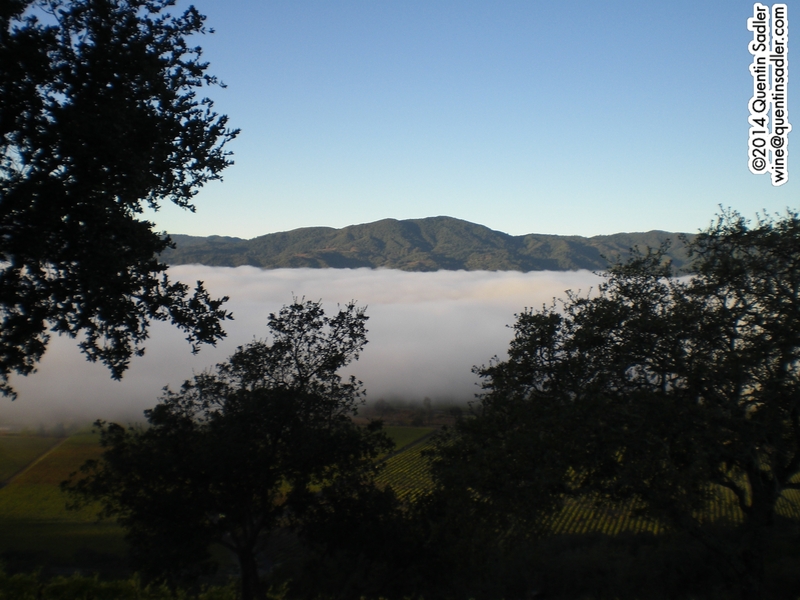 Napa Valley – high above the fog line. This is a single vineyard blend of 61% Cabernet Sauvignon, 15% Merlot, 13% Cabernet Franc, 6% Malbec, 5% Petit Verdot grown high up – at 450–675 metres above sea level, it may interest you to know that Napa itself is only at 5 metres! 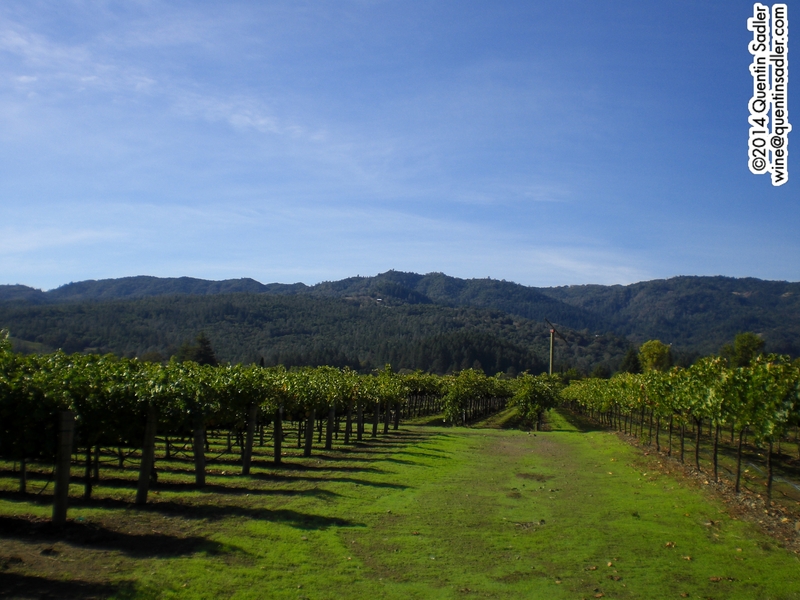 – in the Mayacamas Mountains that define the border between Napa and Sonoma. This wine is astonishingly complex and fine and is far from the fruit bomb of popular imagination for California wines. The fruit is beautifully ripe making the wine rounded and supple, but there is so much more here too. It is a beautiful and very fine wine – 93/100 points. UK stockist information is here. US stockist information is here. 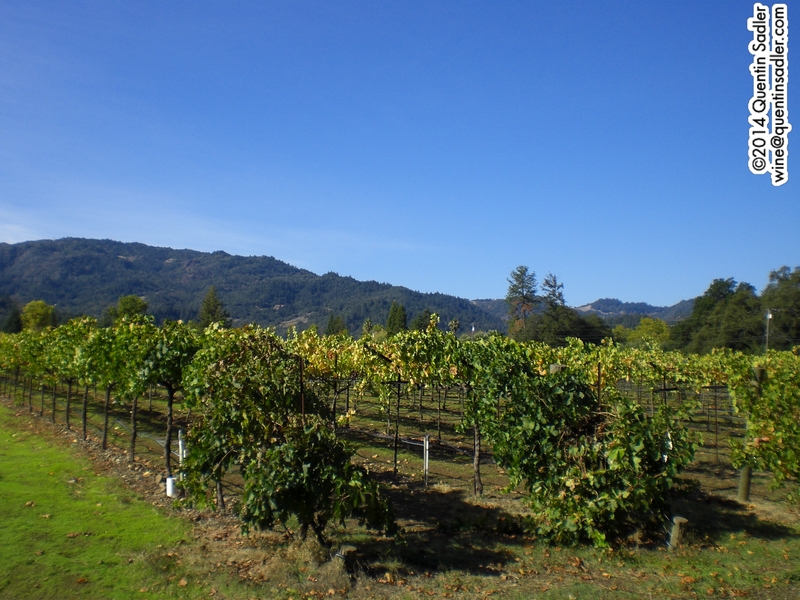 Napa Valley – looking West from St helena towards the Mayacamas Mountains. Another exciting blend, from several vineyard sites across Napa this time, including Howell Mountain, Spring Mountain District and the original Beringer vineyards in St Helena this a superbly supple and complex blend of 95% Cabernet Sauvignon, 3% Cabernet Franc, 1% Petit Verdot and 1% Merlot. The concentrated fruit dominates a bit more here in the classic Napa style, but the finish is savoury, while the fine chalky tannins and touch of minerality add to the finesse and balance. I used to sell Beringer wines a long time ago and am really pleased to see that they are even better now – 91/100 points. Although labelled as a Cabernet, this too is a blend; 76% Cabernet Sauvignon (wines from the US only need 75% to be a labelled as a single variety, most places are 85%) 16% Cabernet Franc and 3% Petite Verdot. As you might imagine the Pedroncelli family are Italian in origin and they have owned this land since 1927, obviously because of prohibition they had to wait a few years before they could make wine – honest officer. They consistently produce wines of very high quality, but which are affordable and very drinkable too. This is a lovely easy drinking, very fruity style of Cabernet, but it has a nice touch of acidity to balance the rich fruit together with very gentle oak which just softens the already smooth tannins, what’s more the fruit, rather than the normal blackcurrant of Cabernet, feels much lighter and plum and raspberry-like. A very happy bottle of wine that is marvellous value for money – 88/100 points. So the next time you want something utterly delicious and rewarding to drink, have a think about California, there is fantastic quality there and often great value for money too. Wine makers and winery owners are usually engaging and interesting people and I have been fortunate enough to meet quite a few in my career. 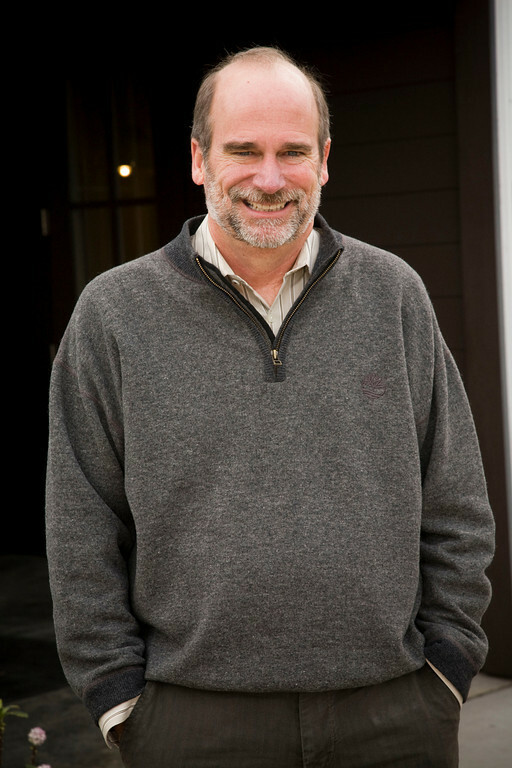 However one of the most agreeable and charming I have ever met is Bruce Cakebread, President and C.O.O. 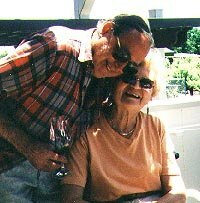 of Cakebread Cellars – the winery that bears his family name. I was thrilled to meet him in Napa last year, I have always loved Cakebread wines, so a it was great to put a personality and a face to the wine. Bruce not only runs the family winery, but is also president of the board of directors for the Napa Valley Vintners. I was saddened to hear of the recent death of Aldo Biale. In partnership with his son Robert, Dave Pramuk, and winemaker Al Perry he was part owner and guiding force behind the wonderful Robert Biale Vineyards. I would like to send my best wishes to the family and everyone involved in that great winery. 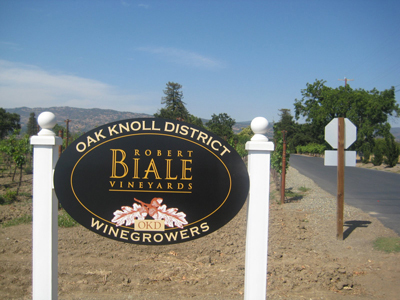 I have a huge amount of respect for what Robert Biale Vineyards does and the people who do it. I had a fantastic couple of days there not so long ago and the night I arrived Aldo had just been taken into hospital, but I was able to meet Clementina his wife of over 50 years, who was a gracious and kindly lady. You can read about my visit here. I really enjoyed visiting the Napa Valley recently, I saw much and learnt a lot. I saw many wonderful wineries, but one of the absolute highlights was visiting a small family owned winery called Robert Biale Vineyards. 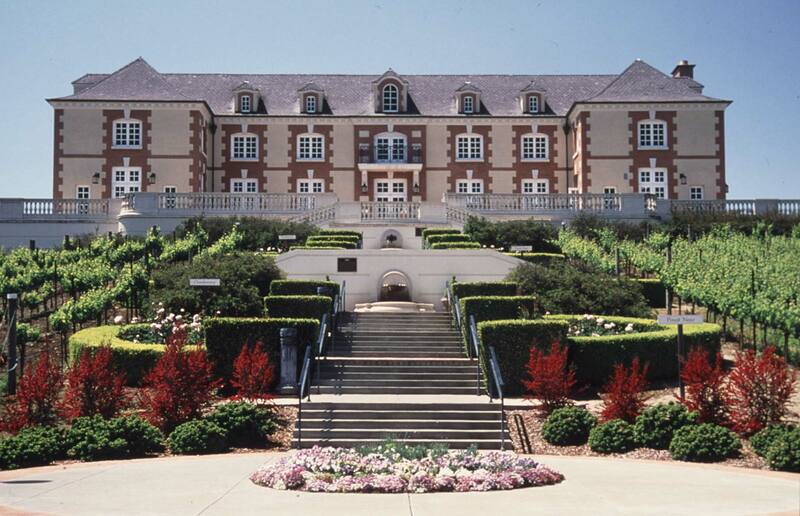 Whilst in the Napa Valley I was fortunate enough to be invited to visit Domaine Carneros. This is a dramatic and beautiful winery surrounded by vines and perched on a hill overlooking the rolling Carneros countryside.